I don't know how it works, but it does and it's delicious! Yes, you heard correctly. It’s a crustless pie and it’s crazy simple to make. I first had it around 1990 or 1991 when my mother and I visited a tea room in Stafford, Texas. The tea room is long gone, but my love for this pie has never waned. If you love coconut, give this one a try and see if it doesn’t knock your socks off. Pre-heat your oven to 350F. Put all ingredients except for the coconut into a blender and blend on low speed for 3 minutes. Pour into a greased 10″ pie plate or casserole dish (I used a rectangle Pyrex). This will puff, so don’t fill your dish to the very top. Let it sit for 5 minutes to allow the ingredients to settle properly, then sprinkle the coconut evenly across the top. Place on a foil-lined baking sheet with a raised edge (to prevent spills) and place in the center of the middle rack of the oven. Bake for 35-45 minutes, or until the top is golden brown, the center is slightly jiggly, and a knife inserted near the edge comes out clean. Remove from the oven and allow it to cool to completely. Like a souffle, this will deflate as it cools, so don’t panic if you notice shrinkage. Serve at room temperature for best results. Leftovers should be stored in the refrigerator. Serves 6-8, depending on serving size. Gorgeous and golden straight from the oven. Note: This recipe was adapted from the Grateful Prayer Thankful Heart Blog who adapted it from the Favorite Brand-Name Best-Loved Recipes of All Time published in 1996 by Publications Limited. Her photo, by the way, is gorgeous. So if you want to see a spectacular photo of this pie, click on the link and be prepared to drool. My version is a cross between her recipe & my mother’s. So I start reading this, then I start drooling, then I start thinking: “Ugh. It’s pie. It must have a crust, which I can’t eat.” And then I see that this is crustless. Hallelujah! 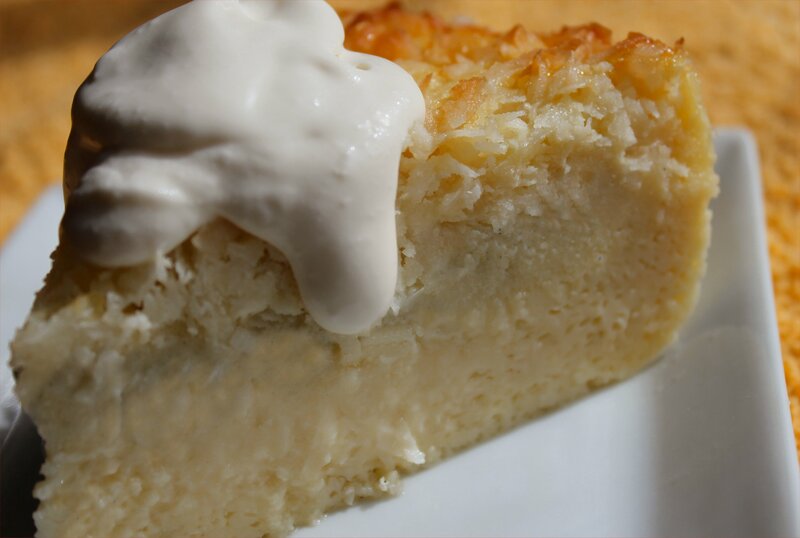 … And basically I missed the title “Custless Coconut Pie” because I was mesmerized by the mouthwatering photos! I love that your 2-part reaction was a surprise inside of a drool session! Win/win. Hope you get a chance to try it. If you do, let me know that you thought. I’m totally making this. I’ve been on a coconut kick lately. Me, too. Can’t get enough. I even find myself eyeing Mounds & Almond Joy bars in the check-out line at stores. Haven’t caved yet, but I can feel it coming! Hi, I made this yesterday, and I have a couple of questions. Was it still supposed to be a little runny in the center? We ate some at room temp. last night and it was good, however I was a little leary because I just wasn’t sure if it was done enough. I baked it for 40 minutes and it was a nice golden brown and even did the knife test. I did forget to add the vanilla extract, dang it, so it could of probably used a little more flavor. I’m absolutely dying here (and I was yesterday as well when I snuck back on the grid). I so adore Coconut Cream pie and that sort of thing. This sounds so wonderful and retro and perfect all at once. I already have the baking pan I’ll use in mind for this. Now I just need to think of the occasion. It might be a self-Valentine’s Day gift. It’s so unbelievably simple, it borders on mind-blowing. I’m thinking of making it again this week for friends. Hope you like it! When you mentioned coconut cream, I envisioned something far more complicated than this. Hooray for my being wrong! I love things that are so deliciously simple. Anything that can be whipped up in a blender is guaranteed a spot in the rotation. I can’t wait to make this for my dad. You’ll want to test it before you make it for him. 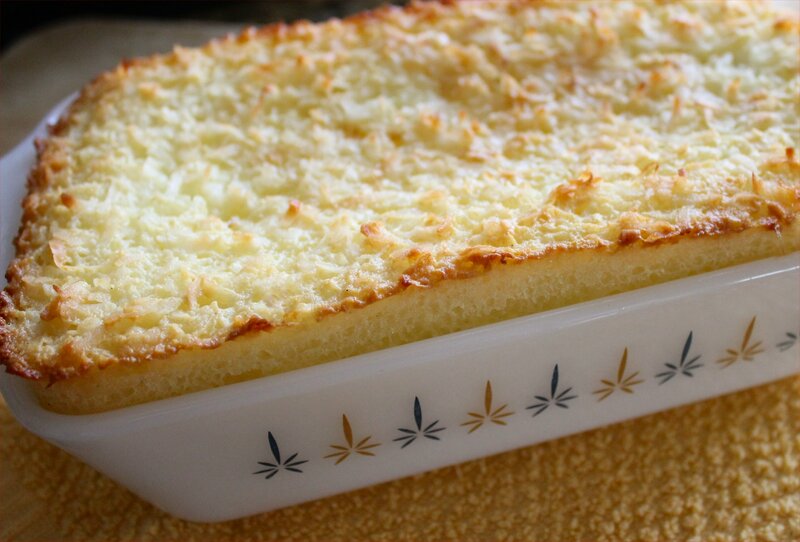 Versions of this crustless coconut pie vary wildly in regards to the amount of liquid to use. Mine came out very jiggly. Shari (comment above) said hers came out a little runny. Just give it the jiggle test before you remove it from the oven. If it’s really jiggly, leave it in a little longer. If it’s done, the very center will jiggle just a smidge, but not very much. I think I’ll update the instructions to say that. Enjoy! It’s super easy and extremely tasty! Wait until you try it. No arm twisting required. I’m thinking about making another one this week! Hello! So nice stopping by to visit with you! Thanks for the link back to my blog :) Happy you liked the pie! That’s so awesome, Michael! Thank you for coming back to let me know how it turned out. I really appreciate it. I’m so glad you and your guests enjoyed it enough to eat the entire thing in one sitting. I’ve often thought of attempting that myself. Well, it was more like over a period of two hours than in one sitting. Each of us kept sneaking back into the kitchen for just another bite until the whole thing was gone! Dark day … Needed something sweet. It’s in the oven right now, however I used muffin tins (with parchment paper – less fat). Smells fantastic – can’t wait to taste. Thanks for all your comments, here’s hoping mine will be wonderful; but even bad sweets are never bad! I just finished one of these for my church’s ladies group meeting. A friend’s husband is always bringing a crustless coconut pie to the supper night at our church. It is so good so I tried to the one that looked and sounded closest to his. I will let y’all know. What size Pyrex did you use?? For this post, I used a loaf pan. Usually, I use a Pyrex pie pan (10″) but an 8″ X 8″ square would also work. As an additional tip, try putting a rimmed baking sheet beneath your Pyrex of choice to prevent any oven disasters if it overflows as it rises. Any suggestions to make it gluten free? Bisquick has regular flour. If you have any trouble finding the ATK recipe, let me know and I’ll e-mail it to you. In the early 90’s I found the best coconut dream bars recipe ever on the back of an off brand package of coconut , lost in move several years back and have been searching for sense ! It wasn’t a impossible crustess pie . It combined as lil flour , I think 4 eggs , brown sugar and possibly white too , water or milk, margarine or butter, salt , I think soda or leavening and coconut , stirred and poured into pan and bake …it was divine ….it came out like pecan pie bar only even better , one would never know the difference , very good with coconut , but with such a simple recipe I decided to use walnuts instead of coconut and see if it would work …and did it ever , the result was a walnut pie bar , just like pecan pie bar only somehow even better ! Could use pecans too but walnuts our my favorite and much less expensive too . I made this for many years to the delight of family and friends , until sadly recipe was lost . If you know of a recipe like this , please share . It was so fast and easy , didn’t even need a mixer , all ingredients went in to bowl , stirred and poured into pan and came out of oven with a yummy crust , gooey center of nougat just like pecan pie or bars , but not quite as rich and sweet , which is what made them even better than pecan pie …. just absolutely decadent :) :) :) If you or anyone you know , has this recipe ….Please Share , I believe it was on back of Western family coconut bag …around 92′ and was called Coconut Dream bars .